Heavy ICBM is a term that was created in the 1970s to describe a class of Soviet and Russian ICBMs (intercontinental ballistic missiles). They were characterized by a heavy throw-weight of 5 to 9 metric tons, several times that of an LGM-30 Minuteman, and a length of over 35 meters, and were thus capable of delivering a large number of warheads in a single MIRV missile. This term usually refers to R-36 / "SS-9 Scarp", R-36M (SS-18) variants / "SS-18 Satan", and the RS-28 Sarmat / "SS-X-32 SNOWFLAKE" missiles. 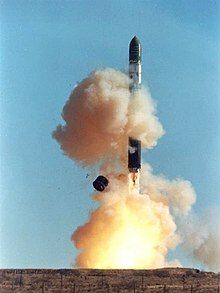 The SS-9 was a silo-launched missile capable of delivering warheads of 5–18 megatons, with a range of up to 15,500 km. These were then replaced by the similar SS-18, with payloads of 18–25 megatons. The silos used for launching were the same for both, once modified. ^ a b Graham, Thomas, Jr.; Damien J. La Vera (2003). Cornerstones of Security: Arms Control Treaties in the Nuclear Era. University of Washington Press. pp. 336 et al. ISBN 9780295982960. ^ "R-36 / SS-9 SCARP". www.fas.org. Retrieved 19 October 2012. ^ "R-36M / SS-18 SATAN". www.fas.org. Retrieved 19 October 2012. ^ "SS-9". www.missilethreat.csis.org. Retrieved 19 October 2012.